MANILA--The injury to Greg Slaughter prompted Coach Yeng Guiao to exclude him from his final lineup for the Philippine team's FIBA World Cup Qualifiers clash against Iran in Tehran on Thursday night. 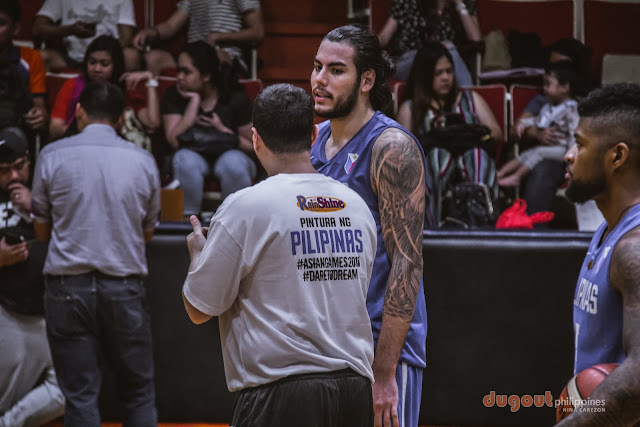 The Ginebra center seemed to be a cinch to make the "Final 12" for the Iran game early into the national team practice, but an ankle injury he suffered last week against NorthPort made him unavailable for the match, forcing Guiao to bring in Chris Standhardinger as the Nationals' main big guy and designated naturalized player as announced on Wednesday. As expected, Guiao will parade a big man-laden roster to match-up with Iran's size as he also named Raymond Almazan, Beau Belga, Poy Erram, Ian Sangalang, and Asi Taulava. Completing the lineup are combo guards Alex Cabagnot, Paul Lee, and Scottie Thompson; and wingers Marcio Lassiter, Allein Maliksi, and Gabe Norwood.